Internationally minded online marketers have to choose between publishing their multilingual content under their main URL (i.e., www.website.com/language.html) or as a subdomain (i.e., http://language.website.com). Where should you publish your multilingual content? Under a regular section of your site? A subdomain? 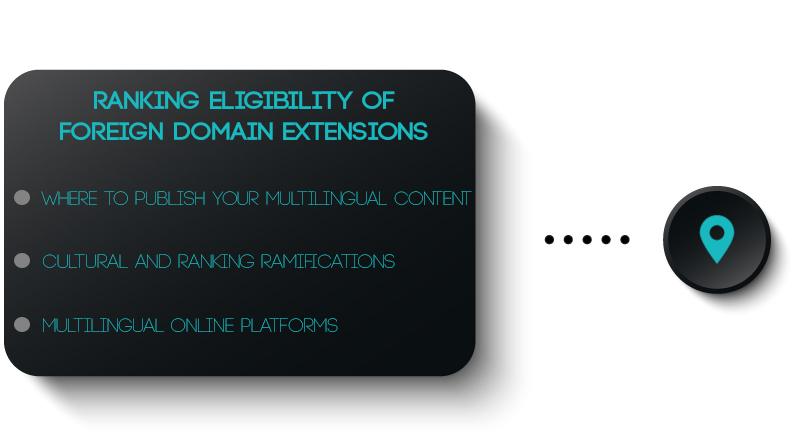 Or should you consider registering new domains with foreign extensions? To answer these questions, let’s take a look at the cultural and ranking ramifications involved with the aforementioned options, and let’s evaluate the pros and cons accordingly. General perception within the SEO industry tends to be that a foreign extension will help the ranking eligibility of a site – in fact, a lot has been said and written on the subject, which unfortunately involves many layers of consideration, thus complicating the simple understanding of publishing multilingual content. Foreign extensions (such as .de, .co.jp, .co.cn, etc.) are very useful when targeting country specifics. For example, when it comes to French, eBay publishes their site under eBay.fr because they are specifically targeting the French online market from France. However, Yahoo in French is featured under a subdomain (http://fr.yahoo.com) as they are more geared toward the global French-speaking market from France to Luxembourg and from African communities to Belgium. Publishing a multilingual content under a foreign extension might help your ranking eligibility as long as the site is hosted abroad and features a rich content (at least equivalent to the main version of your website in English). For instance, if you were to publish a full version of your site, translated into German – featured under yourwebsite.de – and hosted in Germany, this might expedite your ranking eligibility in Germany, but will not increase your chances of success in Austria or Switzerland. When it comes to targeting a specific, unique country, yes, and just in some cases, it would be advisable to register a domain with a foreign extension. However, if you are considering multilingual online platforms from a global language market share perspective, it would be wiser to publish your translated content under your main URL. – Hosting would have to be in Mexico (Mexican IP address) – Website would have to feature contact info in Mexico for directory inclusion (such as the DMOZ) – Content would have to be substantial – Link enhancement in Mexico would need to be implemented (reciprocal links with .com.mx and/or websites being hosted on a server with a Mexican IP address) – Forum and blog posting in Mexico, and articles and press releases targeted to the Mexican market. On the other hand, if an individual is interested in the general Hispanic online market from Argentina to Spain and from Venezuela to the U.S. (the U.S. Hispanic online market is a very lucrative & active segment in terms of market share), it would be advisable to publish such content under the main URL. In this particular case, a link enhancement campaign in Spanish with the entire Hispanic online community would tremendously improve chances of success on a global scale. When considering the registration of a foreign domain, cultural ramifications also need to be taken into consideration. In fact, in today’s context (more so than 5 years ago), it is not just a matter of traffic interaction, but also rather an issue of conversion rate. When registering a foreign extension such as .de, German individuals might perceive it as a corporation faking a physical presence in Germany. German-speaking communities from Austria to Switzerland might look at such registration as a deterrent due to various business cultural habits among these multilingual communities. Same thing applies for French. Are you going to register an “.fr”, “.be”, “.ch”? …etc.? In most cases, featuring the multilingual content under http://language.website.com or http://www.website.com/language.html will be perceived positively by foreign communities – it is usually accounted as a form of respect, as an added convenience to website content information access. Google does advise in their webmaster tools to consider the registration of a foreign extension, but once again, it applies in a few specific cases and it needs to be said that there is no ranking algorithm favoring an .es for Spain versus a website publishing its healthy, optimized Spanish content under a subdomain. I personally suggest evaluating each situation on a case-by-case basis prior to making a decision. Furthermore, the same advice applies to those who write on the subject from a book-knowledge perspective and do not have enough case studies to back up what they are assessing. I have been involved with multilingual SEO since the late 90’s, and in light of the thousands of case studies that I have recorded, each SEO case is different depending on marketing strategy, language and cultural ramifications, and other algorithmic variables pertinent to the overall multilingual content being published.